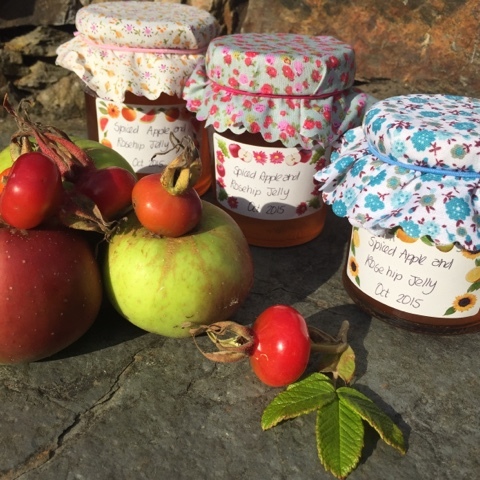 Preserve the taste of Summer into Autumn with a recipe for Spiced Apple and Rosehip Jelly. Nothing tastes better than free foraged food from the hedgerows. It's the season of mists and mellow fruitfulness. The leaves are turning, the nights are drawing in and the hedgerows are laden with berries. This is the time of the year where my thoughts turn to preserving. The combination of fruit, sugar and jam jars enables you to enjoy the Autumn harvest for months to come. Of course when it comes to jelly and jam making there's the complex process of reaching the correct "setting point". Too hard and you won't be able to spread it on your toast but too runny and it will be dribbling off the edges. When I first started making my own jams and jellies I used the tried and tested method that I'd seen my Mum use over the years. Namely the wrinkle test on a cold saucer. I then moved on to a sugar thermometer but the level of the mercury can be tricky to read and you can end up going beyond the point of setting. Both of these methods are far from foolproof in achieving the magic number of 105 degrees centigrade. I've had a Thermapen Cooks Thermometer for a couple of years now but for some reason had never thought to use if for preserving, although I always use it for roasts and BBQ's. 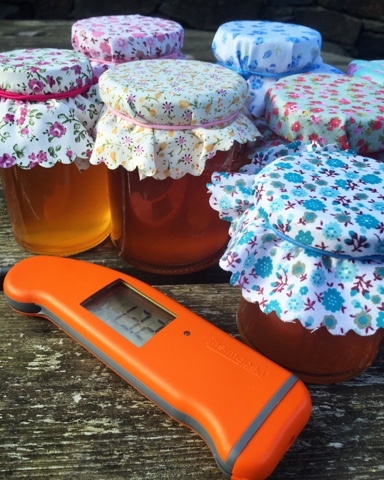 However when Electronic Temperature Instruments asked if I'd like to put the new Superfast Thermapen 4 through its paces by developing a recipe, the time of year meant that preserving was top of my to do list. 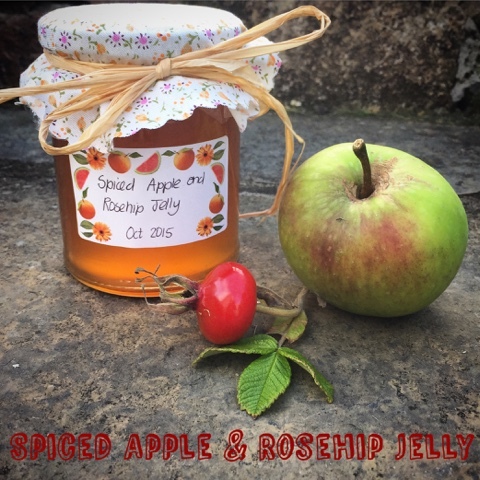 Cooking apples from my Mum's garden and Rosehips foraged from the hedgerows combine with warming spices in this tasty jelly which works equally well spread on toast or pancakes as it does as a condiment in sandwiches or alongside meat dishes. 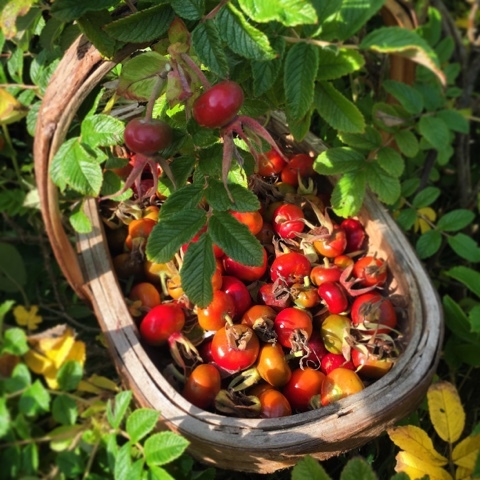 Wash the rosehips and remove any stalks, leaves and dead flower head remains. Place in a jam pan, or a large soup pan, along with 2 pints of water. Simmer for 30 minutes and then give them a good mash with a potato masher to break them up. 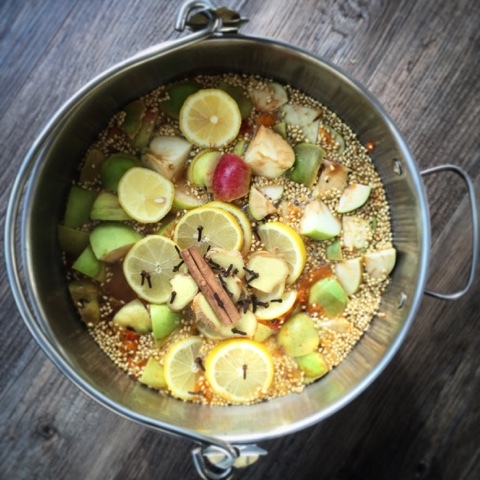 Add the apples and a further 4 pints of water to the pan along with the sliced lemons, ginger, cloves and cinnamon sticks. Bring to the boil and simmer for a further hour. Strain for at least 2 hours in a jelly bag. Don't be tempted to push it through or you will get a cloudy result. 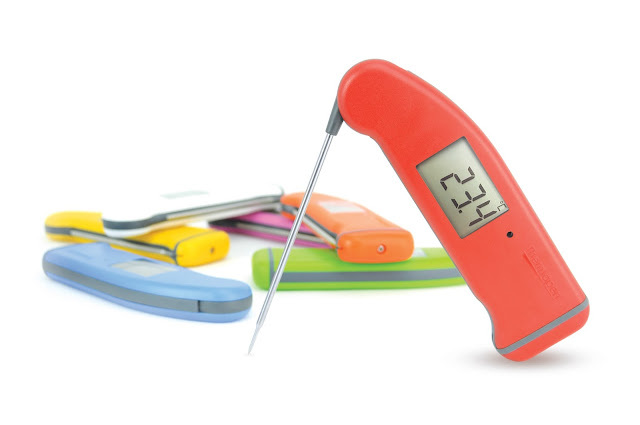 I was really impressed with the performance of the New SuperFast Thermapen 4 Cooks Thermometer. It is even more intuitive than my existing model. The temperature display automatically rotates through 360 degrees so you can see it at any angle. My left handed son found this really useful as he's normally trying to read the display on our existing one upside down. There's also a handy backlight which turns on automatically. Great for when the light is poor or for outdoor use at BBQ's. If you need a boost of light just cover the sensor with your finger. There's a motion-sensing sleep mode which automatically turns the Thermapen 4 on or off when you pick it up or put it down. It will stay on all the time you are using it, but the sleep mode will save battery life which comes in at 3000 hours in normal use. Close the probe when you’re finished and the Thermapen 4 turns off for storage. Disclosure: This is a commissioned post for Electronic Temperature Instruments. As always, all views expressed are my own. 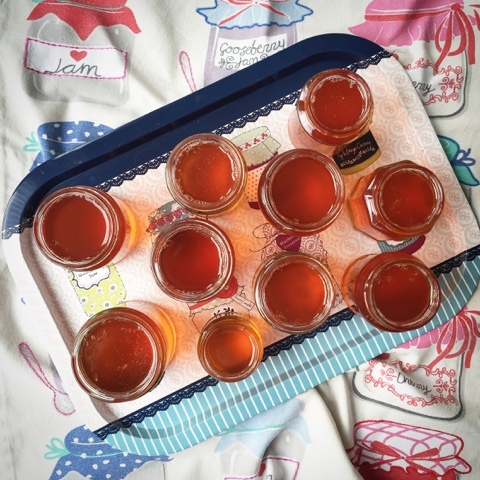 I've made both Rosehip and Crab Apple Jellies recently, and, doh, never thought to use my Thermapen at all... Wrinkles all the way! I love my Thermapen too, just never connected it to jelly making either! Next time - I have a freezer full of Brambles just waiting! I am intrigued as to what you do use your Thermapen for in Vegetarian cookery. Care to enlighten me? I love spiced apple jellies but I have never tried rosehip, bet it tastes amazing though! I don't own a thermapen but it sounds like it makes life 100x times easier! My Thermapen is up there with my most used kitchen gadgets. One you use one you'll never go back to a traditional thermometer. The colours of autumn are just divine! The wrinkle nest is nostalgic but not really an exact science. Your jelly sounds delicious. I've never foraged for rosehips but am quite tempted to now. Definitely something to add to your Christmas list. Do give rosehips a try. Nothing tastes better than free food! I love the sound of this, I have never cooked with or made jam with reships but it sounds lovely. I also have a Thermapen for review and am finding it great! Last used for chocolate tempering and mirror glaze! Chocolate tempering and mirror glaze sound scary, but I could be tempted to give them a try with the help of my Thermapen. Will keep an eye out for your post. I've always used the wrinkle test - it makes me wonder if a thermapen would be easier. Love jams with rosehips too there's none around here at all though as I wanted to make some rosehip syrup for coughs and colds this year. Rosehip Syrup is next on my to do list. I was thinking of using it for cocktails rather than coughs and colds! Just picked my rosehips and gathered the crab apples to make some Rosehip jelly, made Spiced apple and some Mint jelly at the weekend so we will have enough condiments to last till next autumn. Tried making hedgerow jam for the first time this year, big hit with family and friends think I will be making more. I've not managed to track down any crab apples as yet this year and I've never made my own mint jelly either. *adds both to to do list"
Thank you for linking with #CookBlogShare... Definitely saving this one for later!